It’s perfect for law firms, web and creative agencies, marketing & advertising services, business consultant, website design, mobile development company, creative bureau, UX/UI Design. Also, the theme is great for those who deal with branding, style & identity, development, coding & technology, video production, photography, publishing services, printing, programming, App development, digital business, project management, as well as it’s good for a single businessman. Artrium is made with Elementor and is based on our powerful framework which will let you manage the visual and operational sides of your website within minutes. 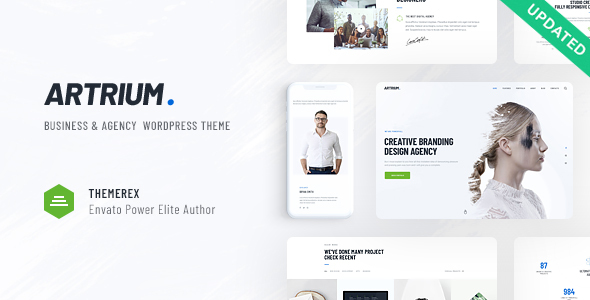 The theme is optimized to work with such popular plugins, as Slider Revolution, Essential Grid, MailChimp for WP, ThemeREX Addons and more! You can also change the look of your website using the popular Elementor Page Builder. Along with the number of widgets and shortcodes and flexible theme options and settings, you are getting lots of pre-made pages, so that you wouldn’t spend much time creating ones for your website.